Above: illustration by Mel Dietmeier. 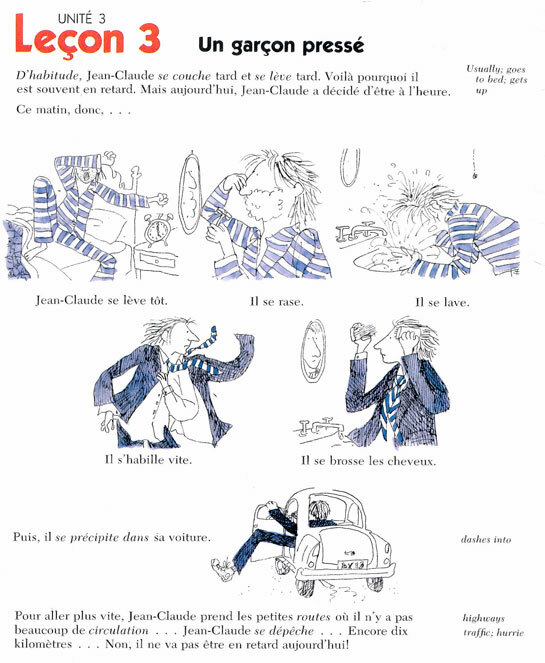 How could you not want to learn French with these illustrations?! So you may have guessed that I took French in high school. The best thing about it was the illustrations in the text book and accompanying workbook. My friend and I were obsessed with them. 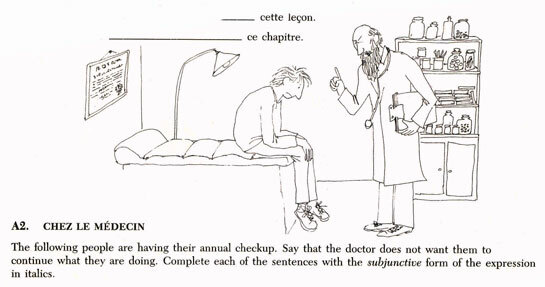 Unlike most text books at the time, it had illustrations by someone who could actually draw and who had a sense of humor. I like how loose and gestural they are, and how all the men have big noses! The drawings made me chuckle then, and they still do now.I’m embarrassed to say that we tore out a few pages from the book before returning it at the end of the school year. This goes against my very core, but it also goes to show how much I loved the art. Recently, I happened upon this folder full of illustrations which I had completely forgotten about! Sadly, none of them have the illustrator’s name, let alone the title of the book. Although, a friend and I came up with this description of the cover: a photo young people with longish unkempt hair having a picnic, there may have been a bike leaning against a stone wall, and of course, there was a boom box. Do any of you know this book or the illustrator? I would love to track them down. Please write in the comment section if you do! 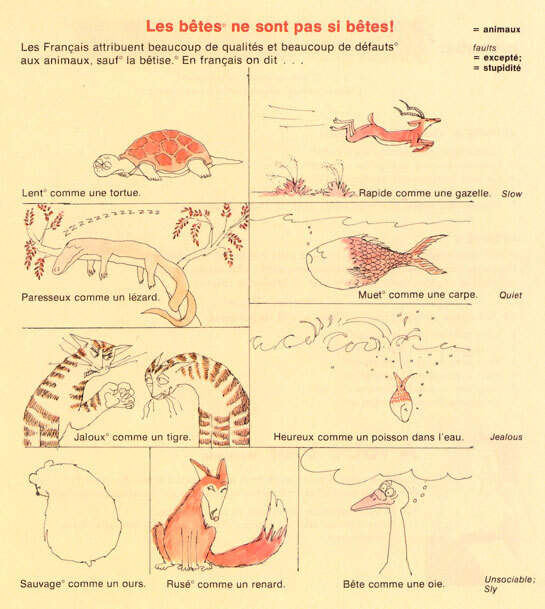 I took French for 3 years in High School but alas I didn’t have this book… what cute and clever illustrations. I recall having a really cool text book in elementary school – 6th grade maybe – that had such cool illustrations that I was constantly copying the characters myself (I was a budding artist at the time – and eventually became an artist for my profession). Those things can really have an impact on children and text book makers should never underestimate the importance of great illustrations for them! Thanks, Pam! I agree. I’d love to see those illustrations if you ever come across them! Don’t know if I have any of those text books or workbooks any more, but I might come across some of my old drawings – I do every so often when I’m digging through stuff. Such fun to see things I drew when I was a kid. I was ALWAYS drawing! 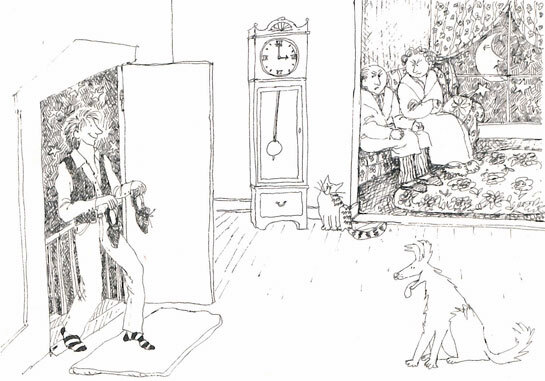 That is great what you said about Steinberg and Gorey – made me chuckle! I needed that today! I always think of them as typically French drawings. Cool they were used for other languages too. Maybe we have a better chance to find out who the illustrator is!! My french teacher sister tells me: I believe this looks like the DC Heath Series, “Discovering French”, which has book levels identified by colors: bleu, rouge, blanc. I don’t have the textbook series, so I don’t know. I have one workbook, which doesn’t id the illustrators. It also may be “French is Fun”, but again, I don’t have these series. ruthie, i had this book too!!! great post! Thanks, Abby! Actually a classmate from high school just sent me the books…follow up post to come! I’m so excited. Next PostLe Tableau – The Painting – GO SEE IT!